Morton neuroma, or interdigital neuroma, is a common condition that involves enlargement of the interdigital nerve of the foot. Morton neuroma most commonly affects the third intermetatarsal space, but it can also affect the second intermetatarsal space, although it does so less often. Lesions in the fourth and first interspaces are unusual. See the images of Morton Neuroma below. Morton neuroma. Longitudinal T1-weighted (left) and short-tau inversion recovery (right) magnetic resonance images reveal a low–signal-intensity mass between the third and fourth metatarsal heads. Note how the mass is inconspicuous on the latter image. Morton neuroma. 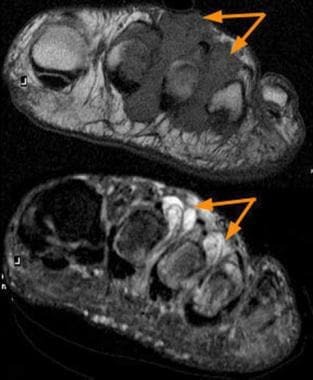 Transverse T1-weighted (top) and contrast-enhanced fat-suppressed T1-weighted (bottom) MRIs show the bulbous morphology of the perineural mass with plantar extension. The administration of contrast material reveals enhancement of the lesion. Rheumatoid nodules. T1-weighted (top) and short-tau inversion recovery (bottom) MRIs reveal large masses at the second and third interspaces. The latter image shows high signal intensity, which is not a feature of Morton neuromas. The patient had known rheumatoid arthritis, and the signal-intensity characteristics of these lesions are consistent with the proliferative synovium seen in this condition. The etiology remains controversial, and treatment varies among practitioners. Diagnosing the condition involves clinical judgment, and in difficult cases, imaging may be useful in determining the precise diagnosis. The differential diagnosis of Morton neuroma includes a stress fracture, a tendon sheath ganglion, a foreign-body reaction, a nerve-sheath tumor, strain of the plantar capsule, and capsulitis or bursitis at the level of the plantar metatarsal-phalangeal joint (MPJ). [1, 2] Occasionally, the diagnosis can be challenging because, in addition to inflammation of the capsule or bursa, inflammation of the adjacent nerve also may be present, causing the neuritic sensation of a Morton neuroma. Peripheral neuropathy also can cause symptoms such as a burning or neuritic sensation, but these tend to occur throughout the toes and on both feet. Additional differential diagnoses with similar symptoms involve neoplasms and fibromas. Imaging studies, particularly MRIs, are a valuable tool in differentiating these conditions. Neuromas are a common ailment seen by foot and ankle specialists. The diagnosis is often straightforward because of the description of a sharp, shooting pain or numbness in the affected digits. However, because the patients' descriptions of the pain can vary or because the pain can be related to another ailment in the differential diagnosis, MRI has become a useful imaging tool in obtaining a precise diagnosis. Ultrasonography also is commonly used. It is more widely available and less costly than MRI. Despite these advantages, the operator-intensive aspects of sonography, as well as its steep learning curve, are limiting factors. Whether ultrasonography will eventually replace MRI as the primary imaging modality for this condition remains to be determined. 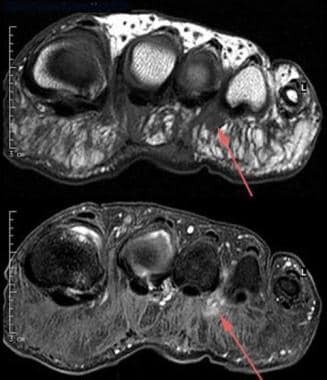 Not uncommonly, Morton neuromas are incidental findings on MRIs; they are detected best on short-axis (transverse) T1-weighted MRIs through the metatarsal heads. Morton neuroma is typically seen as a bulbous mass arising between the metatarsal heads. Because neuromas have a highly cellular and/or fibrous nature, lesions demonstrate low signal intensity on both T1- and T2-weighted images (see the images below). The lesions are highly vascular and are typically enhancing after the intravenous administration of a gadolinium-based contrast agent. Contrast enhancement is best visualized on T1-weighted fat-saturated images. Gadolinium-based contrast agents have been linked to the development of nephrogenic systemic fibrosis or nephrogenic fibrosing dermopathy (NSF/NFD). For more information, see the eMedicine topic Nephrogenic Fibrosing Dermopathy. NSF/NFD has occurred in patients with moderate to end-stage renal disease after being given a gadolinium-based contrast agent to enhance MRI or magnetic resonance angiography scans. NSF/NFD is a debilitating and sometimes fatal disease. Characteristics include red or dark patches on the skin; burning, itching, swelling, hardening, and tightening of the skin; yellow spots on the whites of the eyes; joint stiffness with trouble moving or straightening the arms, hands, legs, or feet; pain deep in the hip bones or ribs; and muscle weakness. For more information, see the FDA Public Health Advisory or Medscape. MRI findings in a suggested Morton neuroma effectively influence therapy. In one study, imaging findings changed the treatment plan in 57% of patients, with the withdrawal of the diagnosis in 28% and with changes in the location or number of detected neuromas in more than 33% of the feet of the remaining patients. Interspace lesions with low intensity appear on imaging studies in asymptomatic patients. Therefore, careful correlation with the clinical findings is essential prior to initiating therapy. Zanetti M, Strehle JK, Zollinger H, et al. Morton neuroma and fluid in the intermetatarsal bursae on MR images of 70 asymptomatic volunteers. Radiology. 1997 May. 203(2):516-20. [Medline]. Quinn TJ, Jacobson JA, Craig JG, et al. Sonography of Morton's neuromas. AJR Am J Roentgenol. 2000 Jun. 174(6):1723-8. [Medline]. [Full Text]. Torres-Claramunt R, Ginés A, Pidemunt G, Puig L, de Zabala S. MRI and ultrasonography in Morton's neuroma: Diagnostic accuracy and correlation. Indian J Orthop. 2012 May. 46(3):321-5. [Medline]. [Full Text]. Turan I, Lindgren U, Sahlstedt T. Computed tomography for diagnosis of Morton's neuroma. J Foot Surg. 1991 May-Jun. 30(3):244-5. [Medline]. Zanetti M, Weishaupt D. MR imaging of the forefoot: Morton neuroma and differential diagnoses. Semin Musculoskelet Radiol. 2005 Sep. 9(3):175-86. [Medline]. Studler U, Mengiardi B, Bode B, Schöttle PB, Pfirrmann CW, Hodler J, et al. Fibrosis and adventitious bursae in plantar fat pad of forefoot: MR imaging findings in asymptomatic volunteers and MR imaging-histologic comparison. Radiology. 2008 Mar. 246(3):863-70. [Medline]. Lee MJ, Kim S, Huh YM, Song HT, Lee SA, Lee JW, et al. Morton neuroma: evaluated with ultrasonography and MR imaging. Korean J Radiol. 2007 Mar-Apr. 8(2):148-55. [Medline]. Mahadevan D, Venkatesan M, Bhatt R, Bhatia M. Diagnostic Accuracy of Clinical Tests for Morton's Neuroma Compared with Ultrasonography. J Foot Ankle Surg. 2014 Nov 26. [Medline]. Unger HR Jr, Mattoso PQ, Drusen MJ, et al. Gadopentetate-enhanced magnetic resonance imaging with fat saturation in the evaluation of Morton's neuroma. J Foot Surg. 1992 May-Jun. 31(3):244-6. [Medline]. Zanetti M, Strehle JK, Kundert HP, et al. Morton neuroma: effect of MR imaging findings on diagnostic thinking and therapeutic decisions. Radiology. 1999 Nov. 213(2):583-8. [Medline]. [Full Text].